Jeremiah reminds us that people can do great things with a minimal amount of qualification and resources. This is an example of the Lord working through their compliance to His way on His time. Our psalm declares that people may accomplish great things through hope and trust in God. This letter from Paul was written to a community that appeared to be on a path to social breakup. The key to the solution of this crisis is found in exercising genuine brotherly love for your neighbor. In his Gospel lessons Luke repeatedly informs us that all who hear Jesus respond with amazement and awe. Although the people in Jesus’ hometown community know Him as Joseph’s son, we herald Jesus as the Son of God. The hometown Nazareth folk want Jesus to perform miracles. Angry people can not accept that Jesus greets them in ministry not in the act of proving His godliness with miracles. “Before I formed you in the womb I knew you, and before you were born I consecrated you; I appointed you a prophet to the nations.” Jer. 1:5. Rescue me, O my God, from the hand of the wicked, from the grasp of the unjust and cruel. Ps. 71:4. Now faith, hope, and love abide, these three; and the greatest of these is love. 1 Cor. 13:13. He began to say to them, “Today this scripture has been fulfilled in your hearing. Luke 4:21.
before you formed us in the womb. even as we are known by you. Amen. In our troubles, God comforts us that we may give comfort to others who experience trials. “Blessed be the God and Father of our Lord Jesus Christ, the Father of mercies and God of all comfort, who comforts us in all our tribulation, that we may be able to comfort those who are in any trouble, with the comfort with which we ourselves are comforted by God. 2 Corinthians 1:3-4. That I wholly Yours may be. The water source for the community is a place where all are admitted, no club membership needed to access this sustainer of daily life. Our psalm is brimming with dyads. As the sun illuminates all, the Creator rules over all. The psalm informs us that we must remain attentive to the Lord’s instruction. Paul wants us to see something more valuable than perceiving unity as uniformity. It is the Holy Spirit that strengthens our best qualities to be used for the good of all. We are individuals within communities, all with strengths as a part and within the whole. It is no reason to separate and apply boundaries between communities as far as the Holy Spirit seeks to join all of mankind. Luke describes how Jesus overcomes temptation through strength from the Holy Spirit. The poor are raised up in the Lord’s favor. In the year of the Jubilee the poor are to be treated as hired hands and not slaves. Jesus validates and removes all doubt that He is the person who is the fulfillment of scriptural prophecy. How can we expect the people from all walks of life within the community to respond to this proclamation? And let me dwell in light with Thee. – Gregory of Nazianzus (Cappadocia, Turkey, BCE 325-390). The joy of the LORD is your strength. Neh. 8:10. Let the words of my mouth and the meditation of my heart be acceptable to you, O LORD, my rock and my redeemer. Ps. 19:14. For in the one Spirit we were all baptized into one body. 1 Cor. 12:13. The Spirit of the Lord is upon me. Luke 4:18. Today this scripture has been fulfilled in your hearing. Luke 4:21. African American Spiritual – Sing Joyfully! Joy to the world! the Lord is come: let earth receive her King. In this poem the prophet Isaiah will not be shushed until Zion is raised up, rebuilt, and transformed into beautiful reality once again. Against all odds, the Lord does not abandon Zion. Christians are called by the Lord to be this stubborn in their refusal to promote isolation and allow hopelessness to win over people’s lives. Our Psalm leaves wickedness at the door and shouts praise to the Lord! As we pray this psalm today, we solidly stand with all who seek refuge. Prayer supports us in pursuit of the Lord’s good works throughout our community and the world. Paul directs our attention to the good works of the Holy Spirit in our community. No one moved by the Spirit is any greater or lesser with respect to anyone else. The Holy Spirit calls upon us to se our individual talents to make our best contribution to the community in Jesus’ name. We are all God’s children. Amen. Mother Mary plays a significant role in today’s lesson. In his “Magnificat” Martin Luther teaches us that Jesus’ mother is poor in material earthly wealth but not belief, nor Spirit, nor knowing what to say to command the moment. Upon seeing the presence of her Son at the wedding, she said only a few words necessary to make her point, “they have no wine” and “do whatever He tells you.” We have a Spanish phrase, a la buena entendedora pocas palabras, “a good understander only needs a few words.” We employ that Spirit today in our celebration. In telling us to do whatever He tells you,” Mary is calling each of us to discipleship in her son, Jesus Christ. The wine Jesus made from water is there for all of us to share. The baby boy Mary delivered at Christmas will soon deliver salvation to her and all of us in dying on the cross and rising. and reveal your good news in Jesus, the Christ. Julia took great interest in political matters and is well known through her prose and poetical works. Battle Hymn was written in 1861 at the outbreak of the Civil War, and was called forth by the sight of troops for the seat of war. Mine eyes have seen the glory of the coming of the Lord (Battle Hymn). he has loosed the fateful lightning of his terrible swift sword. You shall be a crown of beauty in the hand of the LORD, and a royal diadem in the hand of your God. Isaiah 62:3. How precious is your steadfast love, O God! Ps. 36:7. To each is given the manifestation of the Spirit for the common good. 1 Cor. 12:7. Woman, what concern is that to you and to me? My hour has not yet come. John 2:4.
performed by Small Church Music. He makes me lie in pastures green. delighting all who were there. as one body in Christ. Amen. And fill the hearts which You have made. Gospel writer Luke presents John the Baptist as a prophet of the apocalypse that will help the faithful through evil times. Good will win out over evil. God will be there to rule over good times. People in John’s time should repent, get baptized and be prepared for that world of good times. Prophecy states John will not be the man to bring on the apocalypse. This event will occur in the presence of Jesus Christ, Savior. You can imagine the awe John experiences as Jesus appears before him to be baptized. Gods voice from heaven identified Jesus as His Son in whom He is pleased. In Isaiah the Israelites are assured that they are Gods people. There can be no proclamation more exciting than to know God claims you, loves you and will deliver you. Ps. 29 tells us God is powerful. When He makes his presence known to us we must listen. This psalm fits well with Luke’s gospel lesson. to be your people, faithful and courageous. to join in his transforming work. Do not fear, for I am with you. Is. 43:5. May the LORD give strength to his people! May the LORD bless his people with peace! Ps. 29:11. Peter and John laid their hands on them, and they received the Holy Spirit. Acts 8:17. Now when all the people were baptized, and when Jesus also had been baptized and was praying, the heaven was opened, The Holy Spirit descended upon him in bodily form like a dove. And a voice came from heaven, “You are my Son, the Beloved; with you I am well pleased.” Luke 3:21-2.
to proclaim good news to all people. by acts of love in your name. Amen. “We Are Marching in the Light of God” (Zulu). We are marching in the light of God..
Epiphany Celebration Introduction: Epiphany concludes our Twelve Days of Christmas Festival. It is now the magi arrive bearing gifts and Scripture proclaims the Child King, Son of Man, Future Leader, Bearer of Salvation for believers. We will be saved by His blood shed in obedience to the Father. The world as we knew it, know it and shall know it will be transformed. Amen. In this passage, Isaiah introduces the prophetic future success of Zion, which will unfold in parade fashion appealing to the senses, upon rising from the ravages of war and despair, for it will come as the Lord wills it. In this Psalm, David commands us to accept and worship the Lord as Savior as His will be done, not ours. We will follow Scripture into the future as we see the Christ child grow into adulthood and incorporate the aspirational qualities of leader into the examples He sets forth for us. Paul has so much knowledge to share with us. Arise, shine; for your light has come, and the glory of the LORD has risen upon you. Isaiah 60:1. Give the king your justice, O God, and your righteousness to a king’s son. Ps. 72:1. In former generations this mystery was not made known to humankind, as it has now been revealed to his holy apostles and prophets by the Spirit. Eph. 3:5. They saw the child with Mary his mother; and they knelt down and paid him homage. Matt. 2:11.
and return from his presence to live as he has taught. Amen. to offer you worship and proclaim your splendor. Amen. o’er ev’ry thought and step preside. and offer you such gifts as we are able. Amen. What Child is This (Greensleeves). Twelve Days of Christmas begins on the traditional celebrated calendar day of our Lord Jesus Christ’s birth, December 25th, and follows through to the Celebration of Epiphany on January 6th. There is a lot that happens in the Liturgical Calendar in this period of time. Pastors Michael and Cathy Hanus and our Spirit of Peace Missional Congregation invite you to follow along and share the experiences on the journey with us! 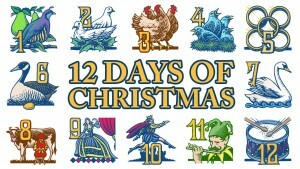 We may all know the Twelve Days of Christmas Song. Ever wonder what investment of resources it might take to arrange an experience like this today? Cost: All these gifts would cost a pretty penny. Prayer is a gift that God has given to us as a means to approach the throne of grace with confidence, like that of a child coming to her parents sharing concerns. It is an opportunity to express the deepest heartache and the greatest joy. Prayer is a conversation between the Creator and the created (us). The conversation began with God, for us, in Christ Jesus. 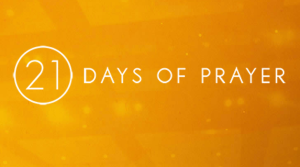 You are free to organize these three days of prayer to appeal to the worshipper that you are. We suggest first organizing these three days in the following manner: Confession, Petition, and Vision. This is a day focused on confession. We have made our lives, our relationships, and even the church, in our own image. We confess that the church belongs to Jesus and not to us. We gather to lay down our pride, our sin and our agenda and ask the Lord of the church for forgiveness, which He gives freely and with mercy. This is a day focused on petition. We pray for our congregation, for the pastor, for the leaders, for those who carry out ministries, for the Sunday School teachers, for the Confirmation leaders, for those leading adult Bible studies and for those leading small groups. Pray for those in all ministries. Pray for all those connected to your church so they might know God’s redeeming love for all in Christ. This is a day focused on vision. We pray that the Holy Spirit will again move through the hearts and minds of leaders and pastors that God’s vision for His church might be revealed and fulfilled. This is a time of prayer for renewal, revival and encouragement. Pray for God’s vision. No matter how you structure this time of prayer, let us come together as an association of congregations across the globe to pray! I believe that the church will never rise up until we first get down on our knees! If you believe that The Lord has more in store for your life, Twenty One Days of Prayer is a great opportunity offering prayer to, and conversation with, The Lord. At the prayer services, you will put seeking The Lord first into practice. When you do this, you may perceive The Lord working on your behalf in ways you have not felt before. You may see a difference in your relationships, your work, your family and every aspect of your life. It is then that you will best be able to spread His love to others. As we continue on our journey through the Twelve Days of Christmas we will present and discuss several interpretations of our Christmas Scripture. Christmas is to be interpreted as: the rebirth of our Lord, the Light shining in the darkness, witnessing to the Light, what Jesus as a child means to us, the Word becomes flesh, grace and intimacy. Jeremiah delivers us to the intimacy of familial relationships as a model for Judah’s covenant relationship with the Lord. The poetic context of Ps. 147 relates snow in Palestine to the Divine mystery of the Lord’s Word in our lives. I will turn their mourning into joy, I will comfort them, and give them gladness for sorrow. Jer. 31:13. Praise the LORD, O Jerusalem! Praise your God, O Zion! Ps. 147:12. Blessed be the God and Father of our Lord Jesus Christ, who has blessed us in Christ with every spiritual blessing in the heavenly places. Eph. 1:3. The Word became flesh and lived among us, and we have seen his glory, the glory as of a father’s only son, full of grace and truth. John 1. Here I am Lord, Is it I, Lord? and be strengthened by one another. remembering its needs before God and this company. but to live them in your Son’s name. Amen. whose birth we celebrate as the child of Bethlehem. with unending praise and thanksgiving. Amen. Jesus Christ, Savior, is born. Mary has given birth to the Son of Man. Joseph takes his place in the background. The Shepherds will soon visit the Child King. The Wise Men are following the Star toward Bethlehem, soon to meet the Christ child after visiting Herod. This is the unfolding story of very important lives we have become familiar with as we follow the liturgical calendar. Epiphany follows the visitation of the Wise Men. Lent follows Epiphany. Holy Week ends Lent. The Blessed Baby Jesus will be obedient to the Father, live an example to His believers (us), and die to gift us salvation. He will promise to send us the Holy Spirit. The promise will be kept. We are blessed. Praise the Lord! The LORD bless you and keep you; the LORD make his face to shine upon you, and be gracious to you; the LORD lift up his countenance upon you, and give you peace. Numbers 6:24-26. O LORD, our Sovereign, how majestic is your name in all the earth! Ps. 8:9. When the fullness of time had come, God sent his Son, born of a woman, born under the law, in order to redeem those who were under the law, so that we might receive adoption as children. And because you are children, God has sent the Spirit of his Son into our hearts. Gal. 4:4-6. When the angels had left them and gone into heaven, the shepherds said to one another, “Let us go now to Bethlehem and see this thing that has taken place, which the Lord has made.” Luke 2:15. God made their tiny wings. 2 Love’s redeeming work is done, Alleluia!